The UNC system is looking for someone to serve as interim chancellor for UNC-Chapel Hill after former Chancellor Carol Folt’s sudden departure. But it’s unclear who might want the job when it also means taking on Silent Sam. When Folt announced her plan to step down at the end of the academic year, she decided to also take Silent Sam’s pedestal down from McCorkle Place and place it in storage with the Confederate monument. The move upset the UNC Board of Governors and led to Folt’s accelerated departure. Folt is expected to leave Jan. 31. A temporary replacement will have to be found by then, and it’s likely to be a familiar face. William Roper, interim president of the UNC system, told UNC BOG members at a meeting Friday, Jan. 25, that whoever becomes interim chancellor must also be familiar with the landscape of higher education. “They must be ready to start on day one, and that means they cannot spend many months getting to know the lay of the land,” Roper said. The interim UNC system president said the national search for a permanent chancellor will probably start in the summer. Until then, an interim chancellor must be found. “Carolina needs a leader who has the gravitas to lead. We need an interim chancellor who will be able to chart the right course ahead and push back where needed,” Roper said. Roper said he anticipates the interim chancellor will have an active role in determining the fate of Silent Sam. That will mean dealing with a faculty interested in having more of a voice regarding the disposition of the monument. On Jan. 10, the UNC-Chapel Hill Faculty Council formally created a committee focused on the future of Silent Sam. The faculty advisory committee will have up to 15 members, appointed by Faculty Council Chair Leslie Parise, after nominations are made. The committee aims to provide input to the university administration; whether it will actually have a say in deliberations over Silent Sam is uncertain. Protestors toppled the monument Aug. 19, and university administrators have struggled to determine the statue’s fate. Complicating things is a 2015 law protecting the movement of historic monuments without permission from the N.C. Historical Commission. The law requires that any monument removed from its location be returned to a place of similar prominence. If the monument wasn’t originally at a museum, mausoleum, or cemetery, it can’t be moved to any of those locations. Parise told faculty council members at the meeting the ultimate legal authority over Silent Sam lies with the General Assembly — not with the university, the UNC Board of Governors, or with the UNC-Chapel Hill Board of Trustees. “They can fix this with a stroke of a pen,” Parise said. Neither the General Assembly nor the N.C. Historical Commission have taken responsibility for the statue. Instead, university officials are trying to find a solution for Silent Sam that works within the law. The BOT in December approved a proposal from UNC-Chapel Hill Chancellor Carol Folt to rehouse Silent Sam in a $5.3 million historical center to be built at Odum Village. Few people were happy with the idea. Those who wanted the statue removed from campus criticized the idea of placing it back on campus in an expensive historical center. 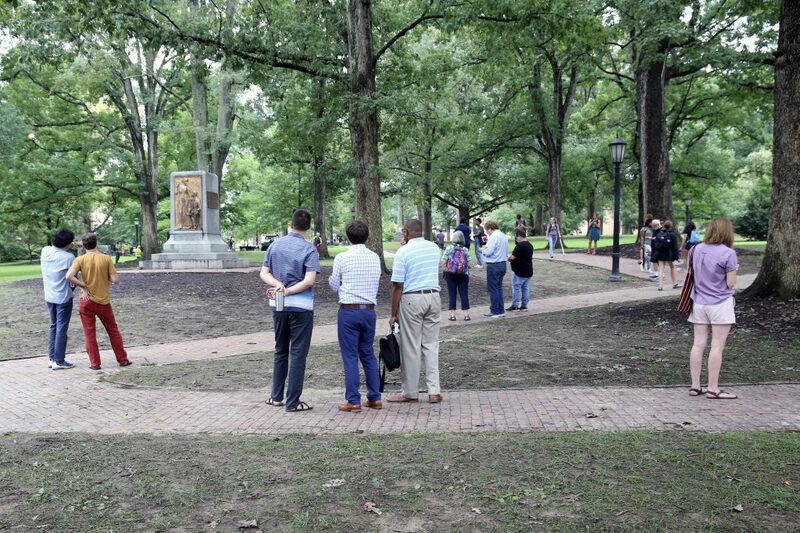 Others argued Silent Sam’s rightful place was back on his pedestal at McCorkle Place, and nothing short of his return there would do. Some graduate students and teacher assistants threatened to withhold final grades if Silent Sam returned to campus. They could have held hostage some 2,000 grades if the university administration failed to meet protesters’ demands. The threats proved premature, as the Board of Governors rejected the BOT proposal during a Dec. 14 meeting. Instead, the BOG created a five-member task force to help the BOT in devising a new plan for Silent Sam by March 15. UNC Board of Governors Chair Harry Smith said the task force will work with key stakeholders and constituents in coming up with a solution for the statue. Parise told Carolina Journal that, as far as she knows, the council hasn’t heard from the BOG Silent Sam task force. The UNC-Chapel Hill Faculty Executive Committee passed a resolution Jan. 22 praising Folt for her time as chancellor. “Her visionary leadership — exemplified by an inspiring strategic plan; successful capital campaign; commitment to diversity, affordability and accessibility; and her final bold action to have the pedestal removed from McCorkle Place — will leave a lasting legacy on this campus,” Parise said in a statement following Folt’s departure.